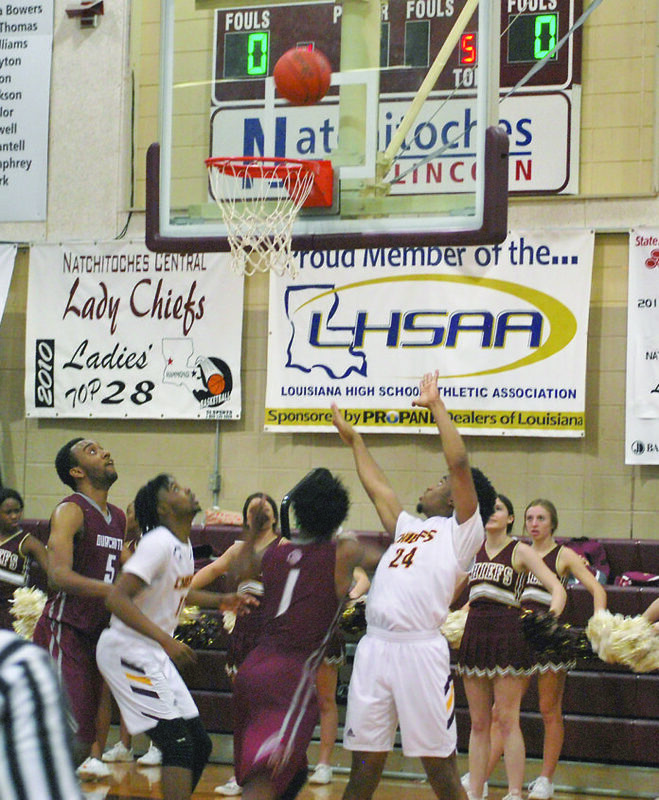 The boy’s game at the teepee Tuesday pitted the second seeded Ouachita Lions with a 25 – 5 record against Natchitoches Central, the number seven seed in class 5-A, for senior night. Both squads were anxious to get on the court as the girl’s game went to the wire and pre-heated the court. Natchitoches Central won the tip but couldn’t score in the front court, but got a steal that was quickly recaptured by the Lions. #1 Owens breaks the ice on scoring hitting a middle of the lane jumper for Ouachita. The Chiefs answer and then the Lions scored again in quick transition. A tip in offensive board tied the score and then a trey got them the go ahead, score 7 – 4. Both teams were lightning fast in transition. Lions got back on top after #24 Jackson was fouled going to goal left handed. They led 9 – 7 with the midway of the first period ticking by. The teams traded ends of the court a couple of times and Lions missed three, 3-point shots and have plenty of offensive rebounds. Coach Micah Coleman called a timeout to re-focus his group. They responded by penetrating the lane and scoring to tie things up at 9 with 1:29 on the clock. Ouachita set their half-court offense and bleed clock until a traveling call gave the Chiefs the ball back with under 50 seconds. Curtis got a mid-range jumper to fall and Chiefs led 11 – 9 as the quarter ends on a foul in transition. To open the second, Lions scored on right handed layup. Chief’s answer with a score. The teams traded three-point shots from beyond the arc. Ouachita got the lead back and has the ball after Chiefs went cold on shooting. Natchitoches Central was in the bonus and had a chance to take the lead back at the free throw line, but no shots fell. They got another chance at the line and closed the gap to one, 18 – 17. Lions are not worried and grew the deficit to six points as they lead 23 – 17 with under 3 minutes in the half. Man to man defense was the set for both squads as the Lion’s made the half time score 27 – 18 in their favor. Ouachita emerged from the break with the lead and the ball. Big #5 Washington got the easy put back rebound for the Lions on their second trip down the floor. Lions were now up 31 – 18. Chiefs #11 Carpenter dropped a shot in the lane and was fouled in the process. His free throw rang true for the “and one” but Lions answered with a score on their next possession. It’s an 11-point game, 33-22, favoring Ouachita. With under four to go, the Chiefs attempted to heat up the teepee with a steal and score but still can not get offensive rebounds to fall in their favor. Play slows with 1:55 ticking by as the Lion’s played for a good shot. They got one as they penetrated the lane for an easy bucket. 39 – 30 at the conclusion of three periods. Carpenter had a spectacular drive and scored early in the fourth and the Chiefs got a layup on the next transition to narrow the gap to five, 39 -34. Ouachita traveled and turned the ball over to the Chiefs and elected to call a time out to settle down. Natchitoches has the ball. They scored and then Carpenter stole the ball. They now trail by three, 39 – 36. Play heated up the gym as the Chiefs kept hanging around down by four-points with under four minutes to play. Carpenter led Chief scoring with 17. Quez Owens put in 17 for the Lions and Jamal Davis added 13.